The family of Sarah Murnaghan is asking for prayers for the young girl as she continues to recover from two separate lung transplants. 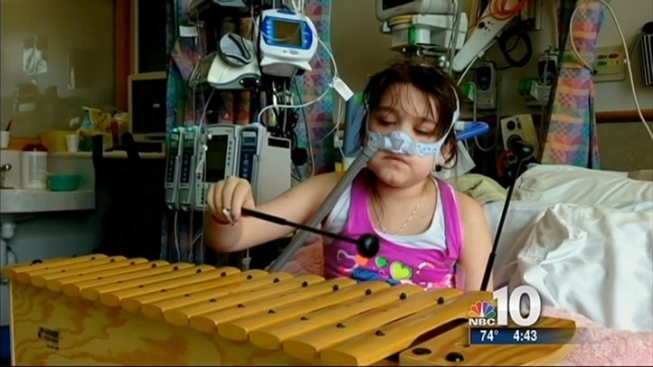 Murnaghan, who has a severe case of cystic fibrosis, received a lung transplant at the Children's Hospital of Philadelphia on June 12 after her family spent months petitioning physicians and lawmakers to allow the 10-year-old to be moved onto the Organ Procurement and Transplantation Network's adult organ donor list. However, Sarah’s mother Janet Murnaghan said Friday that the girl’s health began to “spiral out of control" following the first surgery. She says her daughter's vital signs plummeted, and the lungs began to fail within hours of the transplant. "There were about 30 people in the room and we just kind of stood outside of the room helpless," Janet Murnaghan said. The newly transplanted lungs were removed and Sarah was placed on a bypass machine that took over the work for her heart and lungs -- circulating blood outside the body, according to the mother. That same day, the 10-year-old was also once again placed on the adult organ donor list. Doctors said Sarah developed a complication called Primary Graft Failure, due to the poor quality of the lungs, according to the family. They said the girl most likely wouldn't survive longer than a week on the bypass machine. "The doctors are telling us that the first and second transplants have nothing to do with each other. That the first donor transplant was a donor issue," Janet Murnaghan said. "Her body did not reject them." Janet said the family knew Sarah was being given "marginal" lungs, but were left with no choice because her condition was so dire. Three days later, a new set of donor lungs became available and her doctors performed a second transplant. But the new surgery had its own risks. The new donor lungs, which were also from an adult, were infected with pneumonia. Luckily, the mother said, doctors were able to cut away the portion of the lungs that were infected before implanting. Following the second transplant, doctors kept the girl's chest open to alleviate pressure from severe swelling. “Under a bandage, you can see her heart beating, her lungs rising because she was so swollen from the two procedures,” Janet said. After spending two weeks in a medically-induced coma, Sarah was woken up, unaware of the ordeal that played out. The girl, who is set to celebrate her 11th birthday on August 7, is now communicating with her hands and being weaned off of a ventilator. Sarah is still having trouble breathing because of a paralyzed diaphragm -- a common complication from the transplant surgery. Doctors are expected to fix that issue during a follow up surgery on Tuesday. Asked why the family waited to share that a second transplant had taken place, Janet said they were simply afraid their little girl was going to die. "It was never something that we wanted to keep a secret for any period of time, but it was something that, in that moment, we felt like we weren't prepared to live out her dying in public." On Monday, Janet wrote on her Facebook page that the young girl has been suffering from anxiety and asked supporters to pray for her. "She has struggled with fears that she will suffocate and stop breathing," Janet wrote. "Please pray for comfort and peace of mind that she knows she is safe." Sarah has spent more than three months at CHOP, prior to her transplants, as she awaited a new lungs. Since she was under 12-years-old, Sarah was subjected to a different set of donor rules. Those under 12 who are in need of a lung transplant, must wait until those over 12-years-of-age pass on the lungs no matter how severe a child's condition may be. The Murnaghans challenged the policy in court and on June 5, a judge put a temporary restraining order in place -- allowing Sarah to be placed on the adult donor list. The latest transplant is not a cure for her cystic fibrosis, according to doctors. Although, the transplant will extend her life by several years.